In adventure sports generally, helmets—both their use and type—span a wide range as popularity, technology, and trends change. Mountain bikers always wear them, surfers almost never do, and skiers and snowboarders are somewhere in between. Many aerial parks are adopting them as standard gear for participants, making them a linchpin of safety protocol. As technology improves and more styles of helmets become available while the aerial adventure industry continues growing, the importance of helmet care and upkeep rises. Helmet care may seem like a simple concept, since the gear does not appear to be complicated, but it requires vigilant attention. And the intricacies of proper helmet maintenance can be subtle. Helmets typically come with a certain lifespan, which means that a time will come to retire them. That lifespan is often stated as 10 years—but that is the absolute maximum life. Within those 10 years, there are a plethora of factors that could indicate the need for an earlier retirement. One in particular: the high volume nature of aerial parks boosts the chances of dings and other issues, and makes a helmet’s suitability a daily decision. 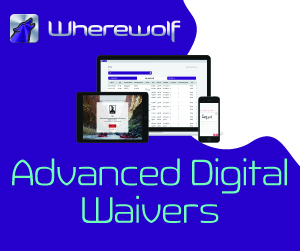 Still, in talking with several well-known manufacturers, there is general agreement on care techniques and considerations. Among the possible issues with helmet wear, a worn helmet headband is sure to turn off guests. Regular inspection is a pillar of good helmet care. 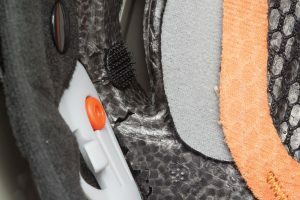 Helmet manufacturer Petzl recommends “a routine check for each use of the helmet, and a regular and detailed inspection by a competent person” at regular intervals, according to company documents on helmet care. That more detailed inspection should take place at least every 12 months, or at the end and beginning of the season, and after any exceptional event in the life of the product. That last condition may not be easy to recognize or discern; customers may not know to report an “exceptional” event, or even realize such an event has occurred. 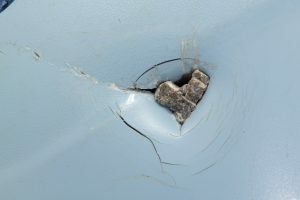 Still, scuffs, dents, or other marks may indicate a bump or knock that merits inspection. Loui McCurley, CEO of PMI, a safety equipment manufacturer founded in 1976, agrees with those recommendations. She also sees two main components to the inspection process: the pre-course inspection, which should be done every time the helmet is used, and the periodic inspection, done independently of daily usage. McCurley notes that the frequency of the recommended periodic inspection depends on usage, which can vary tremendously from business to business and over the course of a season. The more frequently the helmet is used, the more frequent the periodic inspections should be. For the pre-course inspection, both the staff member and the client share in the responsibility of ensuring the helmet is good to go, she says. “This should be done before every use. It should be checked by someone on the course, and by the person wearing it, to some extent. I don’t recommend leaving it all to the operator. There is some amount of personal responsibility, too, before putting it on your head,” she advises. It’s important to remove comfort parts to see what’s underneath; this may reveal cracks in the hidden areas of the liner. For this daily inspection, some main areas to look at, depending on the helmet’s construction, are around the rivets for tiny cracks and imperfections, as well as at all metal components. In addition, look for fraying, cuts, and marks on the chinstraps, as well as any signs of deformation in or damage to the liner. Check the shell for dents, divots, and changes to the shape or color of the helmet as well. It’s easier to inspect some components of the helmet by feel than by sight, McCurley points out, so physically touching the helmet is an important step in addition to a visual inspection. One obvious point for contact: the liner. 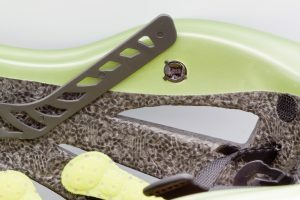 According to Petzl’s guidelines, checking the liner involves removing any comfort pads to check the hidden areas, but not removing the liner itself if it is attached to the shell. The adjustment system should be physically checked for function, and moved in both directions to verify its adjustment setting stays secure. If the adjustment system is broken, the helmet is no longer safe to use. If there is a buckle, buckle and unbuckle it, and adjust any moving parts to make sure they are moving freely. “If there’s an action, do the action,” McCurley says. In the off season (in regions that have off seasons), helmets might spend a good part of their lives on the shelf. It’s important that these shelves, or other means of storage, keep the helmet in good shape. These down periods also provide an excellent opportunity to perform meticulous upkeep. “We store helmets in large sheds that are really well-vented, and the helmets are always stored after they are dried out, with no gas source or heat source near them,” says Gerhard Komenda, CEO of Tree-mendous Adventures, a park operator and the distributor of Edelrid helmets. He stores them in the same room as harnesses, which require similar storage practices. 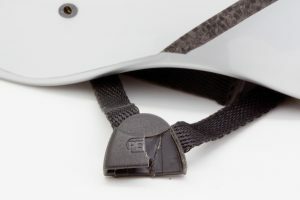 A broken plastic chinstrap buckle will prevent the helmet from functioning properly. When it comes to storage, no detail is too small to ignore, including even what other items are near the helmets. McCurley notes that if cleaning solvents or other chemicals are in close proximity to helmets, these can cause damage even without direct contact. In addition, she recommends the helmets be hung for storage. She explains that if helmets are stored “right-side up” on a hard surface, this can damage the headband—the weight will rest on that area, and that can stress the material. Petzl expands on those guidelines by recommending that operators store helmets away from direct sunlight and UV rays. The company also advises against the dangers of a damp storage room, as moisture can seep into some of the helmets’ parts and lead to mold. The benefits of cleaning a helmet are fairly obvious. Since many different individuals will wear a helmet over its lifetime, helmets can get dirty and take on a certain scent, or worse. But the best methods for cleaning are not so obvious, and there are some pitfalls if the task is not handled correctly. Petzl reiterates the importance of using a mild detergent. 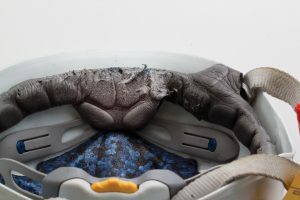 “All other cleaning products, [including]solvents, stain removers, degreasers, etc., are not compatible with polycarbonate, polystyrene, or nylon, and can weaken the helmet,” the company says. Additionally, Petzl recommends against the use of a high-pressure water sprayer. It recommends keeping the water temperature below 85º F, and rinsing thoroughly with fresh tap water after using soap. COMMON SENSE — OR IS IT? Some aspects of helmet health are matters of common sense, but others are less so. Some seemingly innocuous sources can damage helmets. For example: stickers. 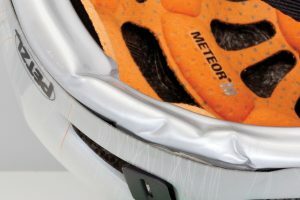 Stickers are not recommended on helmets, unless the manufacturer has a specially designed area for it, as there may be solvents in the sticker glue that can damage the shell. Another example: many operators use a permanent marker to label or identify helmets. And that’s fine, so long as the marker is used only on the “comfort parts and not the safety parts,” according to Petzl. The reason, again, is that there may be chemical components in the marker that can cause damage to the shell or protective liner. “Oftentimes it’s an ingredient you wouldn’t expect that is doing the harm,” says McCurley. A helmet should be retired if the shell shows any signs of impact. If users or staff members stow helmets in a backpack for temporary storage and transport, ensure that they take note of any sharp objects in the pack that may poke or cause other damage to the helmet and take steps to prevent that. If helmets are ever placed in the trunk of a car or bed of a pickup, keep the equipment away from gas cans, batteries, and other chemicals. A trunk could also mean extreme heat, which, along with extreme cold, can damage the shape of the helmet. While such damage is relatively uncommon, it is a reason to immediately retire the helmet. And remember, helmets are often a “one and done” item. McCurley has a protocol she goes by: “If you see an incident where it would have hurt without the helmet on, it is time to retire the helmet no matter what.” A significant shock or impact to a helmet can weaken or damage the protection provided by the helmet, reducing its utility in case of future impacts. Any deformation of helmet parts may be a sign it’s time to retire the helmet. And that leads to a final guideline regarding a helmet’s lifespan. If you have any doubt about whether it’s time to retire a helmet, erring on the side of safety is always a good choice. When the integrity of the helmet is in question—and there are many scenarios where that is the case—the basic rule is to retire it. “When in doubt, throw it out” is the simple guiding principle—and good motivation for maintaining and servicing a piece of equipment that can, with good care, enjoy a long life. Dave Zook grew up surrounded by adventure on the coast of California just north of San Francisco. He started gathering stories before he had a clue how to convert them into magazine articles while playing in the surf and on the trails of Marin County. Eventually that led to journalism school in Oregon where he shaped that interest into a craft, graduating in 2005. He has been pursuing that craft from Oregon to New Zealand and beyond. He is now based in the mountains of Lake Tahoe. He continues to write about his never-ending hunt for adventure.